ART J. FALCO is President and CEO of Playhouse Square and Playhouse Square Real Estate Services in Cleveland, Ohio. one million guests at more than 1,000 curtains with Playhouse Square acting as the major producer and presenter of theatrical entertainment in its 11 performance spaces. Playhouse Square Real Estate Services was founded in 1999 to manage and develop Playhouse Square’s mix of historic and commercial real estate properties. It manages more than two million square feet of office and retail space in the region. Art Falco holds a Bachelor of Science Degree in Accounting and is a Certified Public Accountant. He is a member of the Broadway League, a Tony voter and a trustee of Downtown Cleveland Alliance and Destination Cleveland. 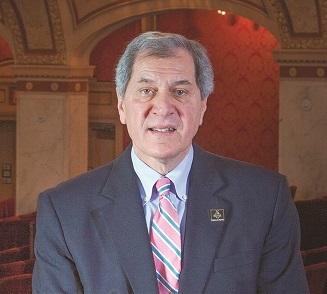 Mr. Falco is also treasurer of the Playhouse Square District Development Corporation, the first special improvement district in the City of Cleveland. complimentary valet parking available at The Union Club. Access the garage off of E 12th.